Is there a combination better than chocolate and Peanut Butter? We think not. Eggs and bacon, mac and cheese, peaches and cream are all great combinations we know but nothing, NOTHING compares to the almighty power of chocolate and peanut butter and once you see these recipes you'll know what we mean. Chocolate fondant cake, with a peanut butter ooze. Prove that chocolate and peanut butter belong together. So YUM! Just the thought alone is making us drool. Donuts, peanut butter annnd chocolate. We mean COME ON! Peanut butter pie with a crunchy buttery crust and a light fluffy filling. Every bite is a little taste of heaven. Yep it's that good. Peanut butter and chocolate at their finest. These peanut butter cupcakes are rich and so delicious. Peanut butter HOT CHOCOLATE. The perfect indulgent drink for the winter months and the answer to all life's questions. The perfect breakfast, crispy chocolate waffles with peanut butter sauce. Oh and it's gluten free. Dough rolled with a brown sugar peanut butter filling, made perfect with a drizzle of milk chocolate glaze. What a masterpiece! 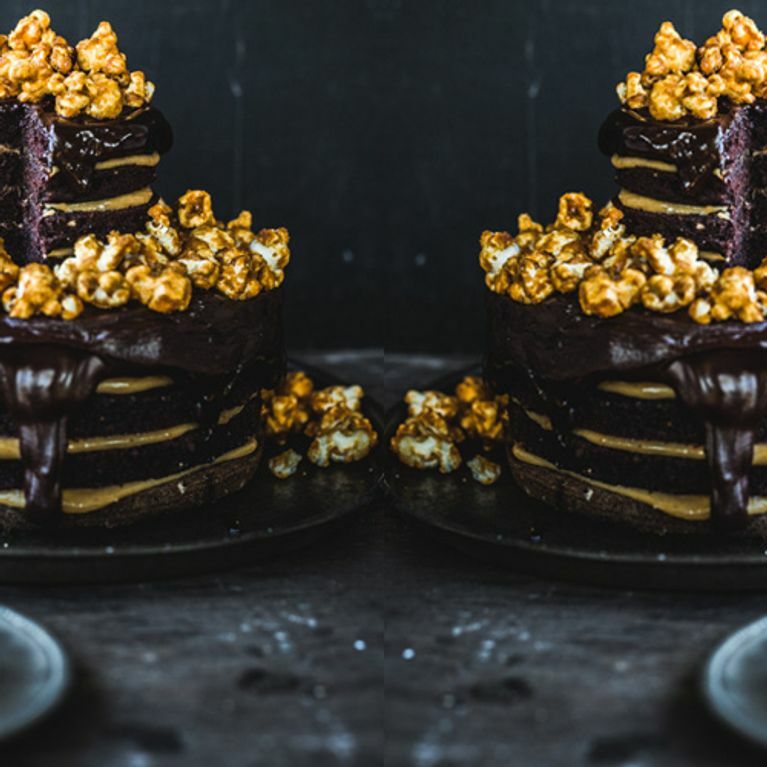 This double chocolate peanut butter layer cake with caramel popcorn is perfect for a special occasion. It's super indulgent and basically makes Da Vinci look like a chump. This might be our favourite type of pizza, rich, fudge chocolate brownie pizza. Sweet, indulgent, peanut buttery and chocolate rich = PERFECTION. We love popcorn, we love peanut butter and dark chocolate, so this recipe is sure to become a firm favourite. Kinda like a brownie but made with white chocolate, making it a blondie. This thick and chewy peanut butter blondie is loaded with creamy white chocolate and plenty of peanut butter chips. It goes perfect with a cup of coffee. We can all agree that chocolate and peanut butter make the best combo and these little pies are all the prove you need. Chocolate and peanut butter bundt cake with a marshmallow glaze, topped with candied peanuts. Get making it now! Why choose between peanut butter cookies and chocolate cookies when you can have both? Banana smothered in peanut butter with chocolate chips and chopped peanuts sprinkled on top. This icelolly makes for the perfect snack. When we say ultimate, we mean ultimate. This cheesecake is loaded with Reese's peanut butter cups, and topped with more peanut butter cups and a chocolate and peanut butter drizzle. You can never have too much peanut butter. The perfect winter treat, chocolate peanut butter banana bread. It's got Banana in it, that makes it healthy right? Add a new twist to your frozen yogurt with this peanut butter and chocolate recipe. Delicious and takes less than five minutes to make. This milkshake is is creamy, extra thick and fudgy and so delicious. A chocolate peanut butter smoothie that is actually good for you. HAPPY DAYS! Just give us a moment while we deal with this beaut of a dessert. Layers of brownies topped with a scoop of ice cream, drizzled with peanut butter hot fudge, and then sprinkled with chopped Reese's. Ice cream, chocolate and a chunk of salty peanut butter fudge in every bite. Your taste buds will thank you. Peanut butter, chocolate and an added spoon of creamy avocado. Healthy and so freaking tasty. Leibniz - i.e. the world's best biscuits - combined with peanut butter and marshmallow to make the ultimate in camping snack. 1. Take a marshmallow and place onto a skewer, setting aside to use later (if you’re using smaller marshmallows, use two or three to cover the biscuit surface). 2. Take two Choco Leibniz biscuits and smear a little peanut butter over the chocolate side of each one. Place the marshmallow over an open flame and allow to toast. Watch it carefully, allowing it to caramelise on its outside, but not burn. 3.Once you’re happy with it, slide the marshmallows off the skewer and sandwich between the two biscuits. 4. ​Gently press together. Give it a few moments to cool slightly before devouring.